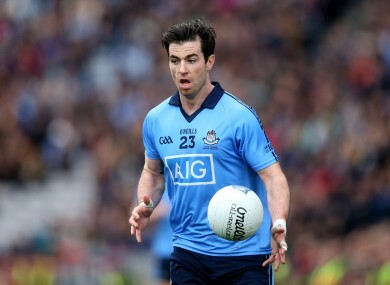 As Dublin prepare for their first away championship fixture since 2006, Michael Darragh Macauley insists it’s just another game for the players. The Dubs star says he's excited ahead of the championship campaign. IT’S ALREADY ONE of the talking points of the championship summer but Michael Darragh Macauley insists the significance of Dublin’s trip to Nowlan Park ‘means absolutely nothing’ to him. Jim Gavin’s side will open their Leinster championship defence against Laois at the Kilkenny venue on 4 June, after it was decided Dublin would play their quarter-final outside of the capital. It will be the All-Ireland champions’ first championship game outside Croke Park since 2006 and while he admits it’s a big deal for the fans, Macauley says the players haven’t even given the venue a moment’s thought. “It means absolutely nothing to me,” he said yesterday, when asked would all the talk of Dublin playing outside HQ motivate him. “I’m just speaking for myself but I don’t think it is going to motivate me or do anything for me, it’s just something new. I haven’t even thought about the pitch dimensions. It comes down to how we play our football. “There’s no sense of trepidation or anxiousness, we’re just looking forward to getting out of Croke Park, going for a road trip and hopefully playing a bit of football in the sun in Nowlan Park. It’s going to be raining isn’t it? The match will be played exactly a decade since Dublin’s last away championship outing, when they faced Longford in Pearse Park. “It was a great day, me and all my friends went down and it was a great day,” Macauley recalls, who was at the game as a 19-year-old supporter. “The place was packed and it was probably 10,000 over capacity that day. It was one of the nicest days of the year and Dublin got over the hurdle in the end though they stumbled along the way. Dublin will be hoping to avoid a similar scare in a fortnight’s time as Gavin’s men go in search of a sixth successive Leinster crown. All the build-up has revolved around Dublin’s invincibility and who can possibly stop them in their quest to lift Sam Maguire again this weekend. The immediate focus is on Leinster and the Dubs’ dominance and Macauley believes the day the players get complacent will be the day they slip-up. “Lads are just focused,” he says. “We’ve been successful in Leinster over the last few years but that’s only because we’ve tried to maintain our own standards and focus on just the hurdle in front of us. “The day you start talking about a Leinster semi-final or a Leinster final is the day that we’re going to get caught or we’re soon to be caught. After missing the entire league campaign, the midfielder returned to action for the demolition of Kerry in the final. With a busy summer ahead, the Ballyboden St Endas man says he’s fit and raring to go. “I was only kind of scraping my way back for the final,” he admits. “I nearly feel a bit guilty because the lads have been working their socks off all year and I only scraped in for the last five minutes to rob a medal. “To be honest, I picked up a knock in the All-Ireland club final so I only got back for that (league final). So I probably wasn’t 100% injury wise, fitness wise, but it was fine, it was grand, it was good to get back wearing a blue jersey. Email “'It means absolutely nothing to me, we're just looking forward to getting out of Croke Park'”. Feedback on “'It means absolutely nothing to me, we're just looking forward to getting out of Croke Park'”.